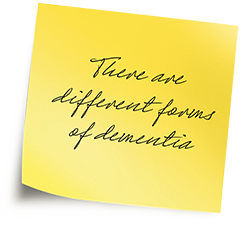 Different types of dementia affect the brain at different rates and in different ways, but other things like someone’s personal circumstance, the people around them and the environment in which they live, will affect their experience of dementia. Dementia progresses in a way that is unique to each individual. It is true that more people over 65 have dementia but it is not exclusively an older person’s disease, younger people get dementia too. Dementia is not a normal part of aging; it is an overall term for a set of symptoms that is caused by disorders affecting the brain. Many people think dementia is the same as Alzheimer’s disease; however, Alzheimer’s disease is just one form of dementia. Other causes of dementia include (but are not limited to) Lewy Body disease, head trauma, fronto-temporal dementia, Creutzfeldt-Jakob disease, Parkinson’s disease, and Huntington’s disease. These conditions can have similar and overlapping symptoms. Some conditions can cause reversible dementias which can be controlled and sometimes cured. Examples of these conditions include certain vitamin deficiencies, medication side effects and depression. In order to understand the cause of the dementia, it is important to arrange for a full medical assessment as early as possible when the warning signs of dementia are noticed.